This is just the most gorgeous shrub that has been putting on this spectacular floral display for over a month now in my garden. It is not a plant you see very often but I think it should be more widely grown because it is just lovely. WHERE DOES IT COME FROM? 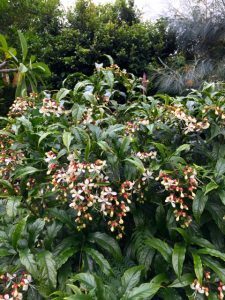 This is often a good clue on how to grow the plant so if you think what a plant from Bangladesh, Sri Lanka, Burma and Vietnam might need you will be at least half way there. Think warm, think tropics and think frost-free. TOP TIP: Because it loses its leaves in late winter, it creates an opportunistic gap in the garden that can be filled with spring flowering bulbs. I have white November lilies planted all around mine that pop up in spring and get supported on the frame of the Clerodendrum while they are flowering. HOW DO YOU PROPAGATE IT? Semi-hardwood cuttings in autumn seems to be the perceived wisdom. They can also be grown from seed – this shrub sets a red, berry like fruit. DOES IT HAVE ANY OTHER FAMILY MEMBERS? Yes, about 300 from climbers and shrubs to tree-like species. If you have ever travelled to Asia you may be familiar with this stunning specimen of Clerodendrum – the Pagoda Flower. 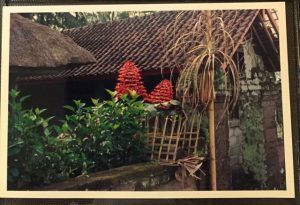 I took this photo in Bali in 1989, obviously taken with the beauty of these shrub even then. 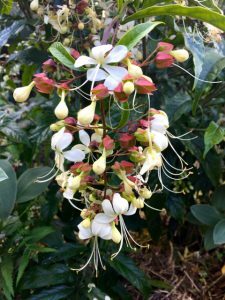 You may also be familiar with the climber, Bleeding Heart Clerodendrum splendens with lovely red and white flowers. NOTE: This plant is in the Lamiaceae family – one that contains the word wide family of mint plants, and many other species in this family have aromatic leaves – just like the common mint; C. bungei apparently smells like burning rubber! and C.trichotomum – peanut butter. Scratch and sniff in the garden? You may have to hunt the Clerodendrums down but, believe me, its worth it.